Your fireplace screen does more than just look great. It also does a great job catching sparks and preventing them from damaging your floor. 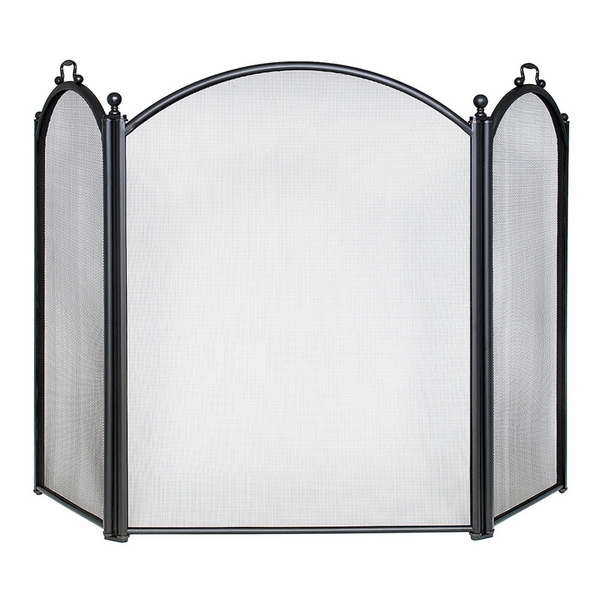 This screen has a black frame and an elegant design with arched tops and finials. Handles on the side panels give you a convenient hand hold when you need to move the screen to tend the fire or clean up the hearth. The center panel is 25-1/2" W x 33" H and each side panel measures 13" W x 33" H.
Is this a see through fireplace screen? While this screen does have a fine mesh layer, you can indeed see through this model. Is this screen black mesh like most other screens? This screen will indeed arrive with black mesh, per the manufacturer. What material are the panels made from? Per the manufacturer, these screen panels are manufactured from fine gauge steel mesh. This new screen is just what we needed. It matches our fireplace tools absolutely perfectly! These two should come as a matching set. They look that great together!